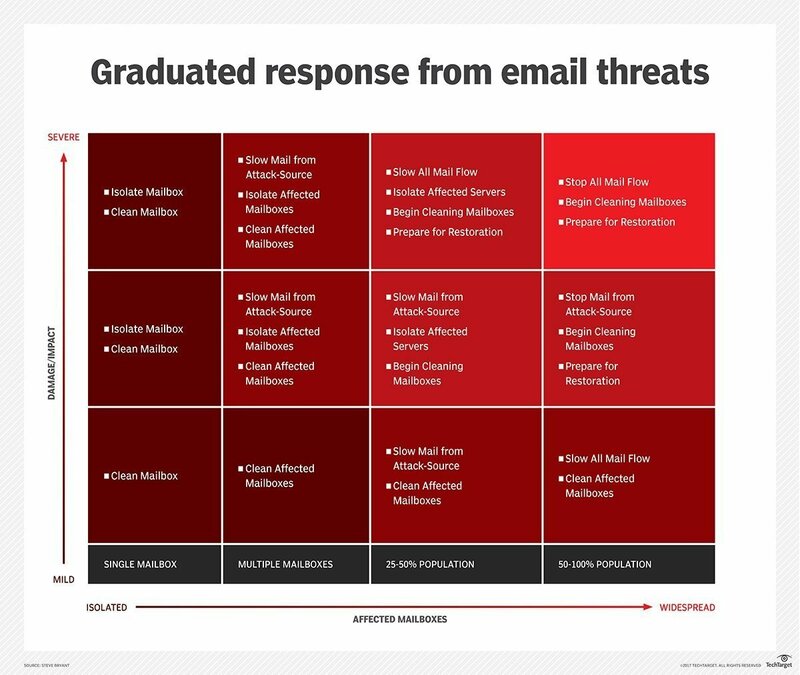 The onslaught of ransomware and devious social engineering efforts means it’s only a matter of time before your organization is hit with a major email virus outbreak. Administrators should prepare on-premises Exchange — and themselves — to quickly stem the bleeding when that malware lands in a user’s inbox. And while the techniques to protect on-premises Exchange Server aren’t new, they are important steps to reduce the effects of an attack. Even if the antivirus scanner fails to detect the threat, there are ways to isolate affected mailboxes, slow the proliferation and even stop the spread of a virus. Have procedures, processes and scripts in place to fight off an email virus outbreak before trouble starts. The risk chart also indicates the appropriate response based on the severity and distribution of the threat. For example, a widespread distribution of the destructive Locky ransomware warrants a far greater response than when the Tinba malware hits a single mailbox. Use this chart as a baseline to assemble a threat-response plan. Follow this link to get the processes and scripts you can use to help slow down the attack.